Joachim Beh works at the University of Stuttgart, institute of aircraft design, and he is involved in the Akaflieg FS-35 project and the E-genius electric motorglider which participated in the Green Flight Challenge in 2011. 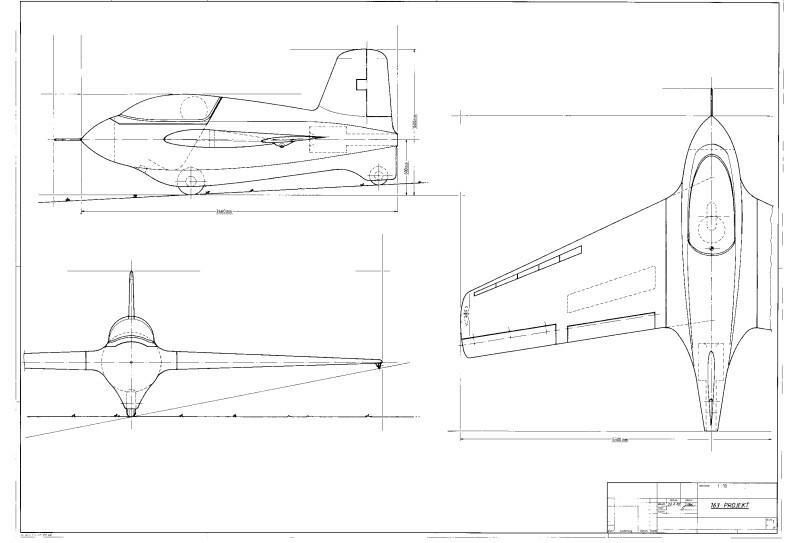 He's also building an aerobatic trainer of his own design, and is also thinking about building a scaled Komet replica. His initial design is shown here to generate ideas and interest. The concept needs further development, and Joachim hopes it can become a group effort to reduce the costs. Joachim explains: "Some friends and I had the idea to start designing a downsized replica, roughly 1:1.7 scale, to make the wonderful flying characteristics available for homebuilders. Like the original we would like to equip it with a towing hook to familiarize with it as a glider. It would have a dummy weight in the back in order to mount a PBS TJ100 jet engine later." More details are discussed below. I got somehow crosslinked via U-tube and Go-ogle... and kind of sucked into the 163 story - now - I'm a fan of old books and love to learn about ground-breaking aircraft designs of which we don't have many nowadays... The essence I got out of all the stories was: the Me 163 - killing far more pilots than enemies - recommended itself literally NOT as a weapon, but as a P.O.H. fighter (pursuit-of-happiness ;-) Everybody who flew it would have stayed IN the cockpit, if the rocket fuels weren't so dangerous! So, what about a downscaled replica (1:1.69 / 1:1.55 giving 5.5m / 6m span)? Detachable wings for transport and workshop access (ever tried to get a one-piece aircraft into a glider club's workshop?) Flyable in the first step as a glider only, with a weight dummy for the engine. Towing speed still acceptable for existing planes like Jodels etcetera, about 140 km/h. The aircraft won't be an ultralight - it will be a delight, but demanding - you'll need at least the JAR-FCL SEP rating plus glider or similar. Stall speed around 100 km/h, best glide around 170 km/h, 1:15, cruise around 250 + km/h, Vne 200-250 knots. With the PBS TJ 100 engine (which is NOT at all cheap - one BD-5 jet has it, as far as I know - around 45,000 euros) you'll have about 45-60 minutes of flight time with 80-100 liters of Jet A-1 fuel. Jet intakes should be under the wings and closeable for glider landings on grass fields to prevent debris getting into the engine. I got a little bit too much inspiration from the BD5 Jet - the nose pitot doesn't make sense on the 163, because it can get damaged very quickly during a nose-down braking attitude - so it should be relocated to the wing - or even better - to the tip of the vertical fin. If you send in comments (contact page), I will add them to this page.